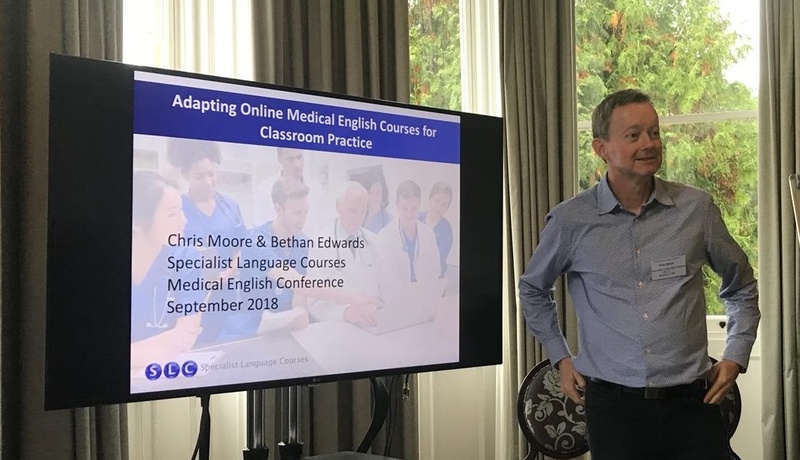 It was great to be at the 3rd International Medical English Conference with Bethan Edwards, SLC’s Academic Director and Virginia Allum, SLC’s Head of Medical English, in Exeter last Saturday, September 22nd. Despite the rain and cold, the mood inside the venue was upbeat and sunny. The programme was well thought through and full of variety with different strands. Research, practical teaching and assessment (OET) were all well-represented, with talks given by an international set of teachers, writers, researchers and practitioners. Some highlights for me were the following: Dr Tudor Chinnah describing the programmes Exeter Medical School have designed to support international students, focusing on the complex crossover between language and culture; Marie McCullagh’s presentation on what she observed on the language and communication style used during multiple consultations at a pain clinic; and the symposium on Humanities in Medicine, where Jonathan McFarland, Emma Black and Ourania Varsou explored different ways of engaging with medicine through art, literature and poetry. It was a pleasure to co-present with Bethan on integrating digital materials into tutored courses. I focused on the ‘why’, while Bethan described the ‘how’, looking in particular at how SLC teachers are using our online OET preparation and Medical English courses with groups of students. Given the increasingly central role of digital in all forms of education, it was great to see the positive response of the audience and to participate in numerous conversations afterwards. The OET (Occupational English Test) was discussed at length in several sessions, from the research behind the test, to materials creation (led by Bethan and Virginia), to operationalising a test at scale – something OET has had to do in the wake of recent decisions by regulatory bodies in the UK and Ireland to recognise OET as a measure of the English used at work by international doctors and nurses. As part of a panel, Virginia and I answered questions on how we created and delivered training programmes to the UK hospitals we work with – including Aneurin Bevan University Health Board in South Wales, whose Associate Director of Nursing, Dr Lyn Middleton, was also on the panel. As a small conference of around 50 participants, this was a chance to spend time catching up with familiar faces and meeting new people from Medical English training organisations and medical universities in the UK, Russia, Bulgaria, France, Malta and Japan among others. Sharing ideas and experiences and making plans for future collaborations is always pleasurable, and this conference was no exception. Watch this space.. Many thanks to Paul East of the Pyramid Group and Ros Wright of EALTHY for organising the day. We’re already very much looking forward to the next one!